Installing hurricane shutters not only protects windows by shutting out debris, but it also helps to protect your entire home during a hurricane. 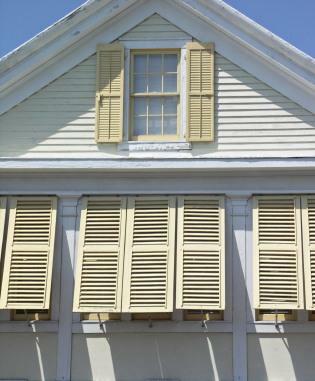 Shutters help protect against wind damage and to keep water from the inside of the walls. Different kinds of shutters meet different needs, uses, and budgets. Each type offers benefits and challenges for the homeowner. It is important to consider both what you need and how much you can spend before deciding on a particular type. Most can be done as a DIY project. Plywood shutters are the most inexpensive of the shutter types. Buy plywood sheets and paint them to seal out moisture. This helps them last for several years. Cut the sheets to fit the opening exactly. They are then set in the window or door frame leaving an inch between the surface of the plywood and the outside edge of the frame. The shutter is then attached with four inch barrel bolts. Drill holes the size of the bolts in the window casing using more bolts for larger windows. Set one bolt in the center of each side, and one in the center of the top and bottom. Be sure to set the plywood into the window frame so that debris cannot get wedged between the window and shutter. Store the plywood between uses. It should be stored upright or completely flat so that it does not warp. Bahama shutters are also called awning shutters. These shutters are attached permanently to the home with heavy hinges at the top. They cover the window at an angle when open, shading it. When closed, they protect the window. A locking latch at the bottom of the frame holds them firmly in place when shut. Awning shutters are louvered and so allow light and ventilation when opened. They are available in both aluminum and wood, with the aluminum being the more inexpensive choice. Bahama shutters are generally opened and closed from the exterior of the home. Installing hurricane shutters of this type is a little more complicated than using plywood but it only has to be done once and is therefore much more convenient when the shutters need to be in place for a storm. Briscoe Shutters has an excellent step by step guide to installing these shutters. Accordion shutters are a variation on the Bahama shutters. These shutters, or shades, are attached to the top and bottom of the window by sliding rails. They are generally made of corrugated metal and slide along the rails to open and close. The shutters lock to each other when closed. Installation of the accordion shutters is actually quite simple. Mount the top and bottom channels. Install an "h" bracket on the top. Screw stops on each end of the window. DoItYourself.com has a detailed installation overview. Colonial shutters look much like traditional shutters in that they are installed on either side of the window. When a hurricane is forecast the shutters are pulled closed and latched in the center. A step by step tutorial with images can be found at Decorative Shutters. Attach the hood assembly to the wall. This is where the shutter is stored when not in use. Install the side tracks making sure that they are plumb to the window opening. Install the operating gear according to directions. Put the slats together and attach to the roll tube, making sure that the hangers go behind the roll tube. Operate the roll tube slowly and adjust the slats as needed. Test the system a few times to make sure it works smoothly. Adjust as needed. Caulk across the hood and the side tracks. The easiest way of installing hurricane shutters is to do it during the construction of the home. In this way the design of the house can be considered and the shutters that work best can be chosen. For example, rolling shutters can be built into the home, if done during the construction stage. This makes them even more secure than they would normally be. Talk to your contractor about the different options. If you are installing the shutters in a preexisting home then consider all of the options, as well as the shapes of the windows and doors. Talk to the experts at your home improvement store. You may decide that it would be better to hire a contractor for the job. Either way, the installation of hurricane shutters can keep your home from thousands of dollars worth of damage during a hurricane or a storm with high winds.